1. Do you accept credit cards and debit cards? 2. Why do locksmiths recommend to re-key all locks when moving into a new house? You need to re-key the old locks of your new home to make sure that you and your family alone have access to the house. The old owners may still have the keys to the property, or they could have taken care of the lock installation and provided you with new keys. To maintain the high security of your new home in Bel-Air or Santa Monica, better play safe and have the locks changed or re-keyed. 3. If my main door lock keys were stolen, do I have to change the whole lock? You don't have to buy a new lock. Just call your locksmith and he will make a new key for you. 4. How do I open a safe without the combination? You can call a locksmith to open it or you can trade with a safeman. The safeman will open the safe and keep it; you, on the other hand, will get the contents of the safe. Yes. You only have to give us a call or go to our FREE ESTIMATE page and fill out the form if you need repairs and lock installation. We will review your form and one of our professional locksmiths will give you a free evaluation. 6. What is the meaning of "impressioning"? Impressioning is a technique of opening lock by making a key for a lock out of a key blank. It is a process of making a new key from a key blank. The procedure starts with smoothing the key blank, then the key blank is inserted into the lock and the blank twisted and rocked up and down. The key blank is then removed and inspected for the marks made with the file on the mark closest. 7. Why it is important to make sure that locksmiths are licensed and professional? Professional locksmiths must have a license to avoid fraudulent activities and to prove that they possess the knowledge and proficiency needed to handle the lock repairs and re-keying. 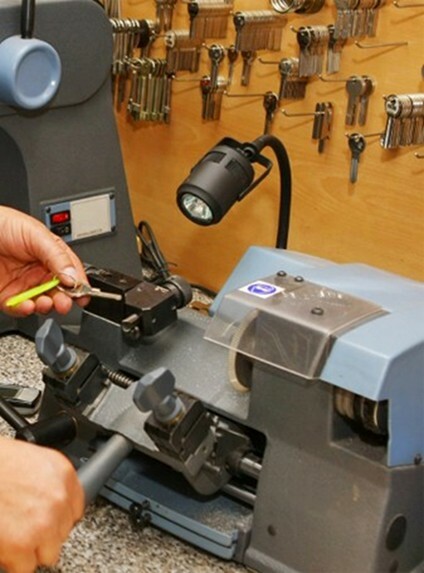 Don't hesitate to get in touch with Accuracy Locksmith if you have any other questions regarding lock installation and repair in Beverly Hills, Bel-Air, Santa Monica, and other areas in Los Angeles.